Harnessing technology combined with a thoughtful insight into how people use it is the key to product development. The SV 971 epitomises these concepts bringing state of the art electronics and a clear user-interface to the world of sound level meters. With a simple and intuitive operation, the SV 971 Sound Meter from Svantek is a hugely popular instrument with Health, Safety and Environmental Officers alike. With simple Start/Stop operation for straightforward measurements, or easily change the measurement settings on the deveice, the SV 971 is an ideal sound meter for many applications, including Noise at Work assessments and Short Term Environmental Noise Monitoring. The SV 971 offers broadband result with 1/1 and 1/3 octave band filters, as well as time history logging and audio recording. 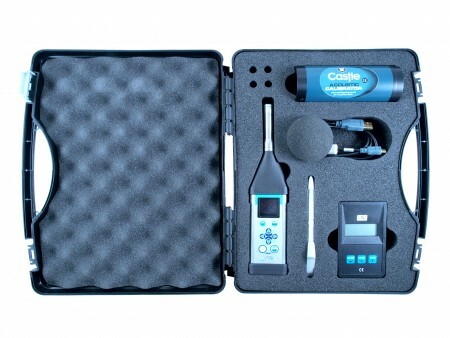 Easily calibrate the SV 971 with a field calibrator, such as the GA607 Class 1 Acoustic Calibrator. Meter Mode Results SPL, Leq, SEL, Lden, Ltm3, Ltm5, LMax, LMin, LPeak plus “running Leq” up to 60 minutes.